TonerGreen Eco-Friendly HP 125A (CB540A, CB541A, CB542A, CB543A) Set | TonerGreen - Eco-Friendly Toners from the U.S.
TonerGreen offers a wide selection of eco-friendly remanufactured HP toner cartridges which helps you cut down your HP printer supply costs by offering remanufactured laser printer toner cartridges compatible with HP printer models. Included in TonerGreen's selection of eco-friendly hp toner cartridges is the HP 125A (CB540A, CB541A, CB542A, CB543A) Set for HP Color CP1215 and HP Color CP1515n laser printers. 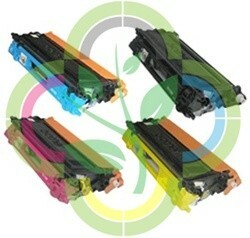 Our HP CB540A, CB541A, CB542A, CB543A Set A Toner Cartridge Set is Eco-Friendly! Remanufactured with up to 75% recycled components, our HP CB540A, CB541A, CB542A, CB543A Set A Toner Cartridge Set is thoroughly engineered to meet or exceed OEM specifications. All our ink and toner cartridges are backed by 100% Risk-Free Guarantee. Aside from that, our remanufactured HP CB540A, HP CB541A, HP CB542A, HP CB543A Set A Toner Cartridge Set is made from 40-75% recycled parts thus are offered at a more reasonable price. Our Toner Cartridge Sets are 100% Made in the US. Our factory is supervised by engineers and experienced technicians who are on-hand to monitor the effectiveness of the remanufacturing process. Furthermore, each TonerGreen Toner Cartridge Set is tested for output quality. Plus, each Toner Cartridge Set comes with 2 Year warranty and we assure you that using our Toner Cartridge Set will NOT void your printer warranty.